Gull taxonomy is in a tremendous state of flux. At this website (with the exception of Iceland/Thayer's) I make no attempt to put forward my view of it-- I'm just trying to go with the flow and present the birds in an orderly manner. This guy pictured above is the form michahellis (courtesy of Don Desjardin, copyright 1998). I say "form" because exactly what is a species or subspecies seems to change with every new field guide and article. This bird used to be part of the Herring Gull complex, and was called a "Yellow-legged" Herring Gull, Larus argentatus cachinnans. It was then considered separate, with a bunch of subspecies of its own. At one point, the Yellow-legged Gull, Larus cachinnans, had the following forms: michahellis, atlantis, cachinnans, ponticus, barabensis, and mongolicus. Michahellis has also been called the "Mediterranean" Yellow-legged Gull, which is confusing since there's already a Mediterranean Gull. Atlantis and michahellis are typically now called the Yellow-legged Gull, even though the birds from northwest Spain are sometimes called the Cantabrican Gull, and may show pinkish legs. Cachinnans and ponticus are now typically grouped and are called the Caspian Gull, Larus cachinnans, though the latter is sometimes called the Pontic Gull. Or sometimes both are called the Steppe Gull, though that name is also used for barabensis, which is sometimes called the Baraba Gull as well. It is viewed as separate from the others. Moving north, Lesser Black-backed Gulls Larus fuscus have traditionally had three subspecies: fuscus, graellsii, and intermedius. 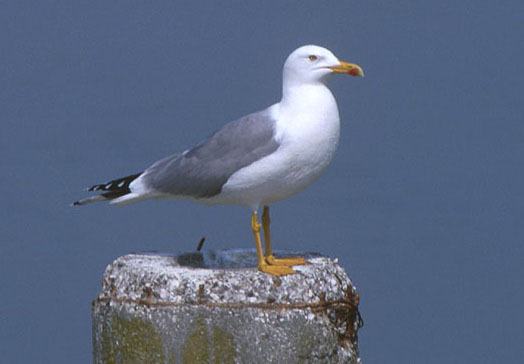 The first is now viewed as separate, and is referred to as the Baltic Gull, Larus fuscus. With the nominate race departed, Lesser Black-backed may now be known as Larus graellsii. Heuglini and taimyrensis have been considered conspecific with Herring Gull and Lesser Black-backed Gull, but are now often broken out as Siberian Gull, Heuglin's Gull, or Tundra Gull, thus setting a record for the most possible names. Vegae used to be part of Herring Gull, but is now called the Vega Gull. Armenicus also used to be part of Herring Gull (and presumably Yellow-legged), but has successfully fought for an independent homeland and a UN seat; it is now called the Armenian Gull. Suffice it to say, I've tried to adopt the lattest usage of the forms and have sometimes grouped forms when it's convenient for my plumage descriptions. Finally, at this website, I treat Iceland Gull and Thayer's Gull as distinct species, while I use the term "Kumlien's Gull" to refer to all hybrids between the two. Thus, I use the term "Kumlien's Gull" in much the same way that "Nelson's Gull" (Glaucous x Herring) or "Olympic Gull" (Glaucous-winged x Western) is used. (Yes, Virginia, you may have a hybrid swarm on the East Coast.) Photos of "Kumlien's" are in the hybrid section.